The 8th Japan-Czech-Slovak Theoretical Chemistry Symposium is planed to be held in Japan in May, 2020. The details will be uploaded. The 7th JCS S​YMPOSIUM was held at the Institute of Organic Chemistry and Biochemistry of the Czech Academy of Sciences, Czech Republic, on May 21 – 24, 2018. The web site is here . The photos are here . The 6th Japan-Czech-Slovak Theoretical Chemistry Symposium was held at the romantic Smolenice Castle near Bratislava, Slovakia, on October 11-15, 2015. The web site is here . 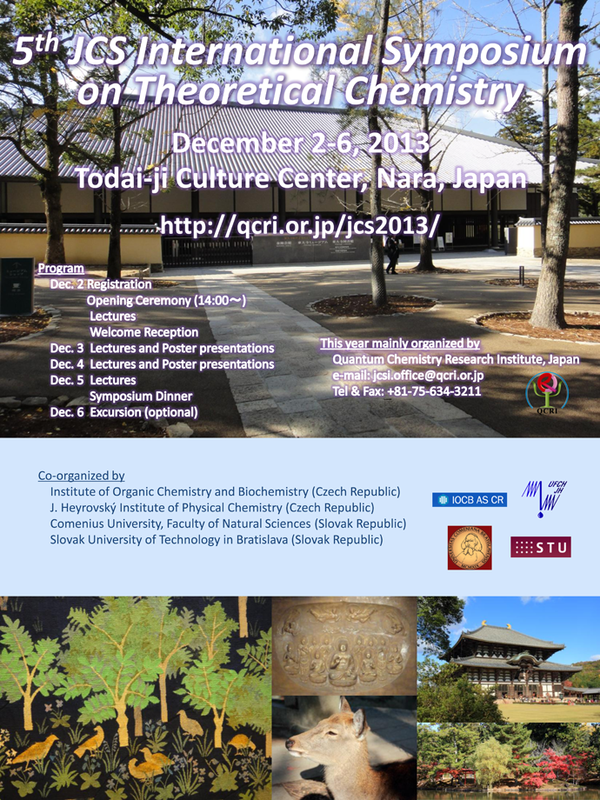 The 5th Japan-Czech-Slovakia (JCS) International Symposium on Theoretical Chemistry will be held at Nara in Japan on Dec. 2nd – 6th in 2013. Please see Web Site. Click to get the pdf file. The pictures are classified into each day of the JCS Symposium. Below is the link to the photo album. The picture with high resolution is linked at each picture. Below is the link to the compressed files of above photographs. The success of the congress is reported in Bulletin of the Academy of Sciences of the Czech Republic. You can download it from here. Special Thanks: Japanese participants who provided us with photographs. Copyright © QCRI. All Rights Reserved.